On the Ethiopians who were killed in Libya, and why we should expect more to come. RAYMOND IBRAHIM: Like the 21 Copts slaughtered before them in February, they were likely impoverished migrant workers from the days of Qaddafi, trapped in post–“Arab Spring” Libya. ISIS killed them in two sets — the first were shot execution-style in the backs of their heads, the second had their heads hacked off. The video is horrific — the blood and gore puts Hollywood’s gory movies to shame. By way of context: Soon after Qaddafi’s overthrow, Ansar al-Sharia — the “Supporters of Islamic Law” — offered rewards to any Muslim who finds any Christians (most being from neighboring Egypt). In the past few years, scores of Coptic Christians were randomly killed — in one instance, a family consisting of a mother, a father, and their young daughter (graphic pictures here). 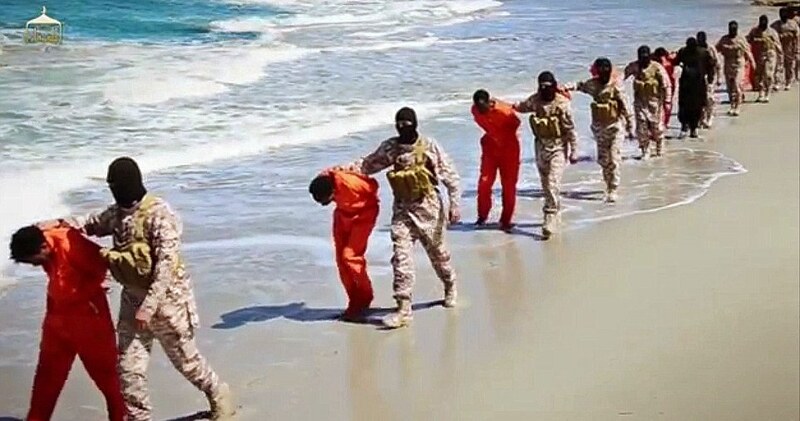 But since Ansar al-Sharia morphed into an affiliate of ISIS, the slaughter of Christians has been even more systematic. LOPEZ: In the ISIS video they are described as “worshipers of the cross belonging to the hostile Ethiopian Church.” Is the Ethiopian Church hostile, or is this just propaganda? These accusations were proven false several times — one woman even appeared on video saying she had voluntarily returned to Christianity — but, regardless, ISIS still cited it in its justification to kill the 21 Copts (as “payback”). Even the 2011 attack on Our Lady of Salvation Church in Baghdad — the attack killed around 60 worshipers, many of them women and children — was blamed on the aforementioned allegations against the Coptic pope in Egypt (as if Iraqi Christians had anything to do with them, even if the allegations were true). IBRAHIM: The effectiveness of this propaganda is simple: No matter how absurd, there are some in the West who are more than happy to leap on such “grievances” and say “Aha, that’s why Muslims are angry! It has to do with economics and politics, and grievances relating to them — not with hostile Islamic teachings.” Anyone acquainted with the “mainstream media,” Mideast academic departments, and, of course, the White House knows what I mean. IBRAHIM: Yes, the recent butchery of the Ethiopian Christians is nearly identical to what happened to the Egyptian Christians. Speaking of propaganda: There is an important but overlooked point to be made here about both groups. They had their heads hacked off because they refused to renounce the Christian Trinity and embrace Islam. Because this little fact does not sit well with ISIS — who are more interested in demoralizing Western/Christian viewers than in inspiring them through the courage of these martyrs — this aspect is not always readily apparent. But ISIS has left many conquered Christians and other non-Muslims who convert to Islam in peace. It has also let some Christians remain, as long as they pay jizya, extortion money, and live as third-class citizens, according to Koran 9:29 and the Conditions of Omar. In the video, ISIS says that the Ethiopian Christians did not pay jizya (likely because they didn’t have any money). This means that the Ethiopians were given Islam’s classic three choices: convert to Islam, pay jizya and remain Christian, or die (according to Islamic prophet Muhammad’s teachings). If they had no money, it came down to convert to Islam or die. Their execution is proof that they refused to convert. It’s the same with the 21 Copts before them — some of whom could be seen uttering Christ’s name in prayer seconds before being barbarously beheaded. And it’s the same with the four Iraqi children who were beheaded for “loving Jesus” and refusing to profess Muhammad the prophet of God. LOPEZ: This latest video also shows people claiming to be Christian in Raqqa saying that life is peaceful as long as they pay a tax for being Christian. Do we have reason to believe that? Shouldn’t that be unacceptable even if true? IBRAHIM: Well, as mentioned, according to strict Islamic law, as long as the extortion money is paid, Christians are allowed to live, but they must follow any number of humiliations (also according to Koran 9:29), including rising up for a Muslim, not building or even renovating churches (a deprivation Egypt’s Christians experience habitually, so that some had to hold Easter outdoors), never showing a cross or a Bible, etc. Incidentally, thanks to Mideast academics in the West, everyone now refers to jizya as a “tax” or “poll tax.” It’s not. It’s money given to purchase one’s life from the sword of jihad. For example, Georgetown professor John Esposito speaks of jizya in almost glowing terms, saying that it was money Christians paid to Muslims to buy their protection against “outsiders,” when in reality the money was, and is, to buy protection against Muslims themselves. LOPEZ: Why should we believe the warning to the West in that video: “You won’t have safety, even in your dreams, until you embrace Islam.” Why isn’t this just propaganda? Of course, there are exceptions — much of Islamic law is based on circumstance — best caught by the phrase “when weak, preach peace; when strong, wage war.” The Islamic world is currently not strong enough to wage an all-out assault on the West. Currently. But if you want to know how Islam behaves toward those “infidels” under its authority, you need look no further than to the plight of Christian minorities from one end of the Muslim world to the other, where they are being slaughtered, their churches burned, their women raped, and their children enslaved (for hundreds of anecdotes from the last few years, see Crucified Again). IBRAHIM: The long and the short of it is, if nothing is done, if nothing changes, there will no longer be any Christians in the entire Middle East, even though they are the most indigenous inhabitants of the region, predating Islam and Muslims by many centuries. Worse, Christians will not simply “disappear” or just “leave.” Many of them — and there are still millions in the region, especially Egypt — will face the fate that the Copts and Ethiopians faced: Choose Islam or death; and many will die, in holocaust fashion. LOPEZ: What worries you most about the White House’s calling this senseless violence? IBRAHIM: That people here are kept in a bubble, oblivious to what is going on — and, more important, why it’s going on. Make no mistake: As mentioned earlier, the slaughter is happening over there, now, but once the opportunity to wage an all-out jihad here presents itself, the slaughter will be coming to the West as well (the beheadings of “infidels” that occurred in London and Oklahoma will not be so rare). “You won’t have safety, even in your dreams, until you embrace Islam” is not an empty threat. Yet, according to Obama and all the “experts,” ISIS has “nothing to do with Islam.” Given such a disconnect, expect the unexpected to happen. Filed Under: Muslim Persecution of Christians, Other Matters Tagged With: Europe, islamic state, Muslim persecution of Christians, U.S.